Top chef Simon Gault has branded a new hybrid plant which grows both potatoes and tomatoes a "gimmick". But the MasterChef judge is intrigued enough by the 'Potato Tom', which hits garden centre shelves in a worldwide first this week, to want one for his own garden. "I could make homemade ketchup ready for my spuds to turn into chips," he said. The Potato Tom was devised by a mystery Bay of Plenty nurseryman who its producers, Tharfield Nursery, is keeping as a well-guarded secret. 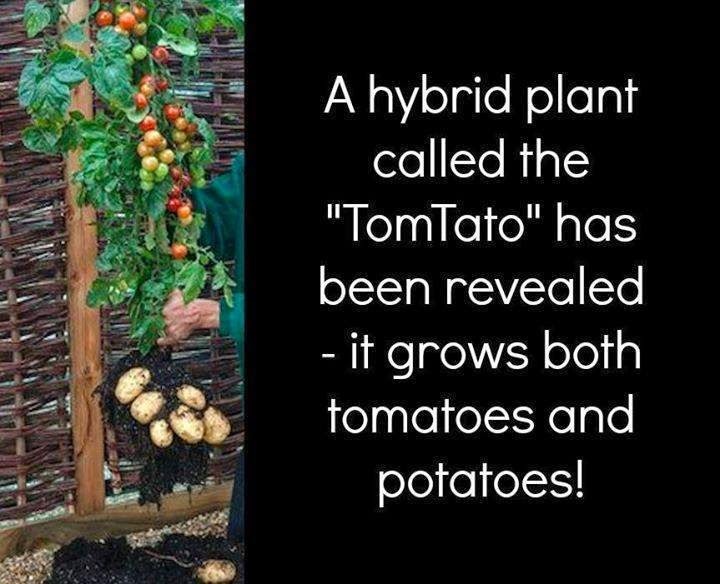 The Potato Tom brings a grafted tomato and potato together in one plant. "We grow the potato, it sprouts, we cut it off and we attach the top part of the tomato onto that. They knit together and form one plant, with the potatoes forming under the ground and the tomato grows on top," says Fiona Boylan of Katikati's Tharfield Nursery. A hybrid vegetable is created when plant breeders intentionally cross-pollinate two different varieties or species, aiming to produce an offspring (hybrid) containing the best traits of the two parents. An example is Juliet, a 1999 All America Selections winner. It offers great taste and productivity along with improved disease resistance to increase your success in the garden. In general, hybrids offer some combination of these favorable traits: dependability, lower care, early maturity, better yield, improved flavor, specific plant size, or disease resistance. Hybrid vegetables typically look like the veggies you’d find at a supermarket. Some very strict gardeners will hint that a hybrid is taboo, inferring that it’s a genetically modified plant (GMO). That is incorrect. Cross-pollination is a natural process of crosses within the same plant species. In hybridization, pollination is carefully controlled to ensure that the right plants are crossed to achieve a combination of characteristics, like bigger size and better disease resistance, etc. The process of developing a hybrid typically requires many years. great for sustaining families needs with the garden's space. One additional advantage is that no chemicals are added unless you add them. Where Can I get one of those plants?